Is your dog constantly scratching and developing areas of redness and irritation? Skin allergies are common but always check with your veterinarian before making a diagnosis of skin allergies. 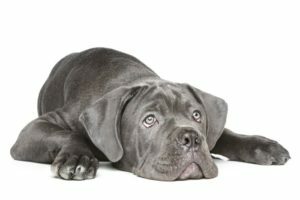 Once you know that your dog is, indeed, prone toward allergies, you’ll need to be more aware of what he comes into contact with and what eats – and that includes the tasty dog treats he munches on. Since commercial dog treats contain so many ingredients, you could end up offering your dog a treat that makes his skin allergies and irritation worse. Plus, dogs can also experience allergic reactions to environmental allergens such as plants, trees, and grass. If you know what your dog is allergic to, it’s easy to avoid those particular foods. If you don’t know, it’s best to stick to grain-free treats made with simple, nutritious ingredients that help fight inflammation rather than provoke it. It’s not hard to make yummy, dog-approved treats that meet these criteria – like these homemade dog treats for skin allergies. In the small bowl, mix together the banana, egg, and peanut butter until smooth. In the larger mixing bowl, combine the chickpea flour, ground flaxseed, and ground turmeric. Pour the wet ingredients (banana, egg, peanut butter) into the dry ingredients (flour, flaxseed, turmeric). Combine the two and mix to form a thick dough. Use the spoon or scoop to place treat-size mounds of dough onto the parchment paper on the metal baking tray. Gently use the palm of your hand to flatten the dough until it’s around ¼ inch thick. Place the metal tray with the dog treats into the oven. Let the cookies bake at 350 degrees for 30 minutes. Check the cookies at 30 minutes and again at 10-minute intervals until the treats are firm and golden brown. Remove the cookies and let them cool off. Once cool, place the cookies in Zip-locks bags and store in the refrigerator. What Are the Health Benefits of These Dog Treats for Skin Allergies? Chickpea flour is a grain-free and is higher in protein than other forms of flour. The peanut butter, egg, and ground flaxseed in this dog treat provide an additional source of protein, making these cookies a high protein treat for your dog. Chickpea flour is a good substitute for wheat flour for dogs with suspected wheat or grain allergies as it’s free of both potential allergens. This recipe for dog skin allergies also includes banana, a good source of potassium, vitamin C, and vitamin B6. Ground flaxseed is a good addition because it’s rich in plant-based omega-3’s. That’s beneficial since omega-3’s help reduce inflammation, the driving force behind allergies and skin irritation. Ground turmeric is also a spice known for its anti-inflammatory benefits. These are vet-approved ingredients that are safe for your dog. The top foods that dogs are allergic to, according to veterinarians, are beef, wheat, dairy, egg, chicken soy, lamb, pork, rabbit, and fish. According to Modern Dog Magazine, the top three all-time foods dogs are allergic to are beef, dairy, and wheat. Keep in mind, the recipe above uses one egg. If you believe your dog is allergic to egg, substitute ¼ cup of unsweetened applesauce in the recipe and in other recipes that call for an egg. If possible, get your dog tested and see what specific foods they’re allergic to, so you can avoid them completely.